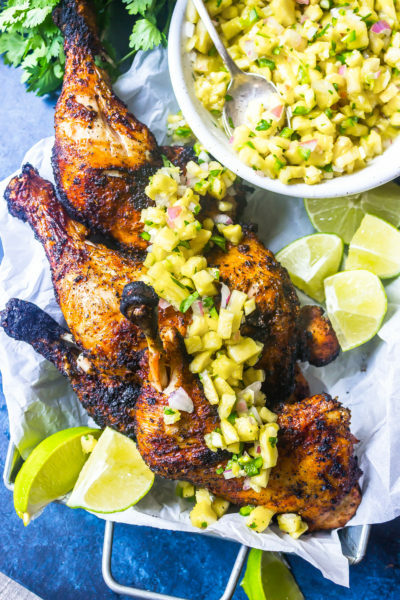 This Grilled Chicken with Pineapple Relish is a great grilling recipe that’s super easy with minimal ingredients. Most of the flavor comes from spices you probably already have on hand, making this a snap to whip up. Preheat the grill to high. Drizzle the oil over the chicken and rub with the spices. Place the chicken on the grill and grill 25 minutes, flipping once, until the chicken reaches an internal temperature of 165° F.
For the relish, simply combine all of the ingredients in a small bowl. To serve, top the chicken with the relish.